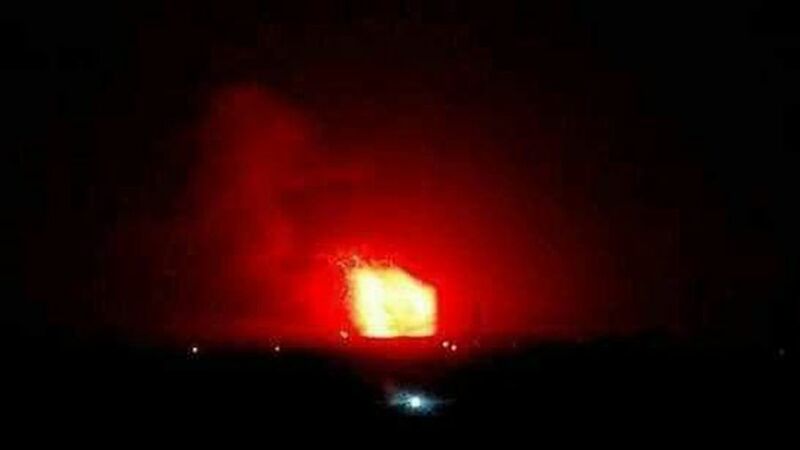 The Syrian news agency reports that shortly after midnight, Israeli air force missiles blasted Iranian military facilities at the Sheikh Najar industrial zone north of Aleppo, Jibrin and the town’s international airport. SANA says 70pc of the town’s power was knocked out and the town went dark, and the several Israel missiles were intercepted. Syrian opposition sources add that the Israeli strike targeted arms and ammunition depots belonging to the Iranian Al-Qods Brigades in the Aleppo region and explosions shook the town. This was Israel’s first air and missile attack in Syria since the last meeting in Moscow between President Vladimir Putin and Prime Minister an Defense Minister Binyamin Netanyahu on Feb. 27; it came less than a week after Netanyahu returned home from Washington after US President Donald Trump signed a decree of recognition for Israeli sovereignty over the Golan. The attack also came just a month after the Iranian, Syrian and Iraqi chiefs of staff met in Damascus to chart steps for reopening the Syrian-Iraqi border and advancing Tehran’s aspiration for a land bridge. US Secretary of State Mike Pompeo, during a two-day visit to Jerusalem last week, warmed that Al Qods chief, Gen. Qassem Soleimani “never rests for a single moment” when it comes to military activity against the US and Israel in the region. According to DEBKAfile’s military and intelligence sources, Iran moved its military hub in Syria away from Damascus and further north in the past month. Iranian transport planes carrying weapons systems and ordnance for Hizballah and the Shiite militias no longer put in at Damascus airport. They land at Aleppo. While relocating this hub, Tehran also reduced the numbers of Revolutionary Guards officers and men serving in Syria by some 30 percent – mainly to economize, since Iran’s oil revenues have been drastically slashed by US sanctions. The renewed Israel assault on Iran’s military supply pipeline to its surrogates in Syria coincided with a UN Security Council session called to condemn US recognition of the Golan as sovereign Israeli territory, with the support of a majority of members. Israeli Ambassador Danny Danon argued in his speech that no country in the world would think of handing over strategic territory to its greatest enemies. If it were not for Israel’s control of the Golan, the Iranian army would be sitting on the banks of the Kinneret (Sea of Galilee) which Israel would never allow. Our military sources add that already, Iranian officers and soldiers deployed in southern Syria have reached a point just 25km from Israel’s inland lake. Maybe mental health or substance or Quran abuse make those Iranians to so easily forget that the place is not healthy for them? At the time of his death Arafat said “Bring the children to play with my doll” very much the same as Michael Jackson said 5 years later. In military command and in normal conflict, no matter your feelings you have to come to grips with the concept of acceptable loss. You’ll try to minimize the loss but you know you have to accept it. The Ayatollah is willing to have a lot of people die, lose a lot of military hardware, have the economy badly damaged – in furtherance of the goal. So far the Ayatollah appears to believe the losses are acceptable. I’m not sure the people he rules generally agree with him, but enough do agree so that he is still in power. It would not stun me if a year or two from now the Ayatollah is living off his billions of dollars in some place like Switzerland – and terrified at the idea of returning to Iran. This is incorrect of acceptable loss ; By Persian view they are the next target of USA , that are building a pipeline via Afghanistan to wherever , thus trying to control basically all the ME oil , and at a same time removing Syrian and Lebanese oil terminals . It did not work so far , since no matter what Americans and Israelis do , Persians are on the borders with Israel . Moreover its a balancing act . As far as acceptable loss , just watch what happens if American move further together with Israel . It was told to them whenever they took Iraq , that there will be North Army taking over Jordan. You have it -Central Asians are on the border with Israel and Jordan , and as you might understand the acceptable loss will be disappearance of Jordan , followed by street fights in Israel , and followed by Americans . If this is acceptable loss –than you have it.Just matter of time…. President Trump should help Israel to finish the job , that is to get rid of the mulahs . Some F-22 will be very welcome. So you don’t understand a thing. Grow a brain, please. regime change is only successful and enduring when you have a higher quality ethical replacement, and a population that appreciates it. Don’t hold your breath for either in iran. Is Solomeini a crypto? I wonder. Who knows. but it is enough that he is both anti-Israel and extremely badly informed, only half literate and his posts are irrelevant, which tells you he has a huge ego. With arrogance goes ignorance. Need I go on? But he win the war on Syria, he defeat isis, he avoid the régimen change, he puts hisbola on Israel bordes, he humillante usa on Iraq.. The real question: how did the squatter-bombers latest sneak attack benefit the Saud family’s heart-gobbling mercenaries in Syria? What happened to Putins malfunctioning S400 “air defence”? I get the feeling Russian tech is so outdated it can only shoot down civilian planes (which it has done over and over again). Putin wants to rule Syria. Iran is a pest to Russia. Great job IDF. Let’s finish the job. Gotta love the LOSER censors at Mossad. The antisemite squatter army will move on to Hizbollah once it murders any Semitic arab in Occupied Palestine with a balloon. Peace will come to the region when Hamas and Hezbollah are utterly defeated and killed and their widows and orphans are wailing in the destroyed rubble of their streets and towns. Make it happen IDF! The antisemitic squatter army decided it was smart to ally themselves with the Saud family heart-eaters and got their faces smashed in. Now they’re too busy slaughtering medics and teenagers to worry about a real army. Mossad will keep on censoring this page, because they HATE BEING TOLD HOW BADLY THEY GOT DESTROYED. The antisemite army served as the ISIS air force for years. That precisely explains the logic for this sneak attack, which otherwise has no strategic value. OF course the LOSERS who censor for Mossad hate to admit this, and hate to admit even further how badly they got their BRAINS BEATEN IN by Hizbollah, Syria and Iran.